Explore 3 unique areas of the famed Okavango Delta while staying in luxurious eco camps. Your last stop is an elephant sanctuary where you can interact with the resident herd and observe their behavior up close. 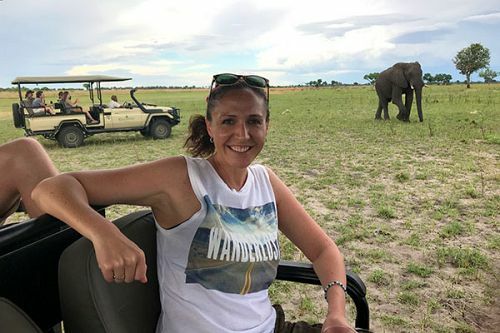 This Okavango Delta Packages: Luxury Botswana Vacation and Elephant Interaction trip was crafted for a couple from Florida who wanted to celebrate their wedding anniversary with an unforgettable adventure. They had seen the Okavango Delta on TV, and this world-famous wildlife viewing destination had captured their imaginations. We created this custom Okavango Delta package so they could see all the highlights of the park, along with some unique experiences. Their adventure began at Jao Camp, where luxurious comfort meets pristine natural surroundings. Their large suite commanded magnificent views over the river, and they enjoyed a classic Okavango Delta safari experience with game viewing in a traditional mokoro boat! Their water safaris took them up close to the enormous herds of elephant that make the Okavango Delta so renowned. Next up on their Okavango Delta Packages: Luxury Botswana Vacation and Elephant Interaction trip was Mombo Camp. The camp’s location is known as “the Place of Plenty,” as it is considered one of the best areas for wildlife in Africa. At this camp, the focus was on game drives to see large predators like lions and leopards. Between Jao Camp and Mombo Camp, they got a perfect mix of land- and water-based wildlife viewing, but their adventure wasn’t over yet! Their last stop was Abu Camp, a fabulous Okavango Delta camp that’s home to an elephant sanctuary. Not only did they enjoy more wildlife safaris here, but they also got to interact with the resident elephants! They also decided to spend a night on a star bed, soaking up the unspoiled views of the night sky and becoming immersed in the bush as it came to life around them. The star bed was a highlight of their trip and certainly not an experience to be forgotten! As their Okavango Delta Packages: Luxury Botswana Vacation and Elephant Interaction trip came to an end, they returned home full of incredible wildlife stories to share with friends and family. Welcome to Botswana! Arrive into Maun airport and catch a light aircraft flight to the famed Moremi Game Reserve in the Okavango Delta. Your home for the next 3 nights is Jao Camp, a luxury tented camp offering an iconic Okavango Delta experience. Its remote island setting commands views over fringed islands, riverine forests, and floodplains—a diverse landscape inhabited by a wide variety of animals. The camp provides all your creature comforts, from indoor and outdoor showers in your luxurious suite to a spa, gym, and pool in the main camp. Relaxing on your private verandah, sipping on cool champagne and looking out over the river, you’ll feel immediately immersed in your incredible natural surroundings. Spend the next 2 days on safari in the Okavango Delta! Float down crystal-clear channels on a mokoro (dug-out canoe) to see wildlife wading through the waters; hop in a boat for a river cruise to take in the sights and sounds of this wetland paradise; spot the variety of game that frequents the drier areas while on a game drive vehicle; and enjoy delicious gourmet picnics and sundowners out in the bush. Back at camp, you can relax with heavenly massages on your private deck or in the spa, and unwind each evening with al fresco dinners around the campfire. Today, hop on a short flight to another area of the Moremi Game Reserve en route to Mombo Camp. The camp’s location is known as “the Place of Plenty,” as it is considered one of the best areas for wildlife in Africa. The area boasts enormous concentrations of plains game and predators which begin virtually on Mombo’s decks, the surrounding floodplains teeming with game year round. 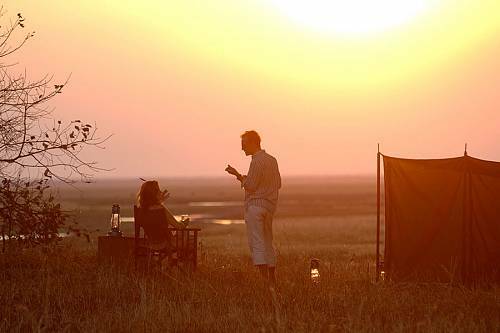 Continue your Botswana safari adventure at Mombo Camp. 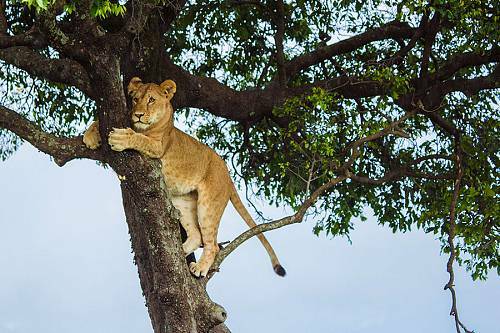 At Jao, the focus is on the water activities for which the Okavango Delta is famous, but here, you’ll have more opportunities to see predators like lions and leopards, as well as enormous herds of giraffes, buffalo, and other plains game. 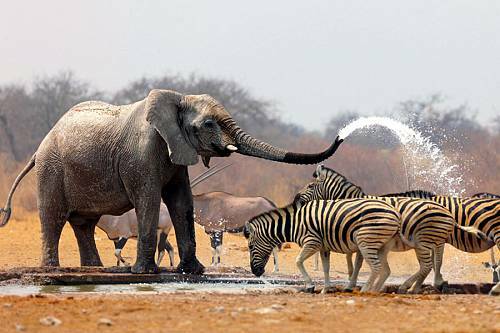 In between game drives, head back to camp to cool off in the heat of the afternoon. Enjoy a dip in the pool or a relaxing massage on your private deck, soothed by sounds of your pristine natural environment. Today, it’s on to your last stop, a unique camp in the heart of the Okavango Delta. Abu Camp is home to an elephant sanctuary, and here you’ll have the opportunity to meet the resident herd, interact with them, and observe their behavior. This is a wildlife experience you’ll never forget! Enjoy your final 2 days on safari in this drier, channel-filled area of Okavango. See elephants, zebras, leopards, impala, warthogs, and other abundant wildlife on game drives and mokoro safaris. If you’re looking for a little variety, you can opt for a helicopter excursion to see the world-renowned Okavango Delta from above (additional cost) or spend a night under the open skies in a star bed near the elephant boma. Today, your incredible Okavango Delta safari adventure comes to an end. Enjoy a light aircraft flight to Maun airport and catch your onward flight home. Please note: The pricing for this sample vacation package is based on travel during the shoulder season. Inquire to see the cost for your travel dates. 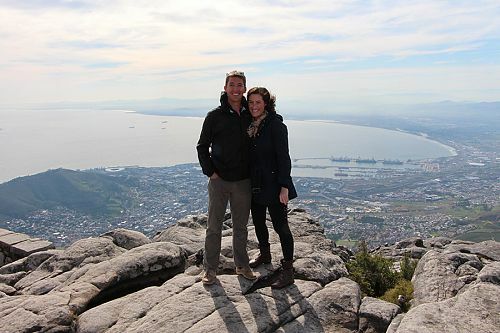 South Africa, Devil’s Pool, and My First Botswana Safari!